Crochet fingerless mitts, wristlets, hand warmers, or arm warmers – whatever you call them, they’re are a constant favorite this time of year! 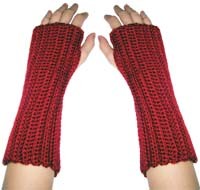 They keep you warm but leave your fingers free – to type, drive, text… or to crochet more fingerless mitts! Here are 10 simply marvelous crochet fingerless mitts patterns to keep your hands warm and your fingers busy! 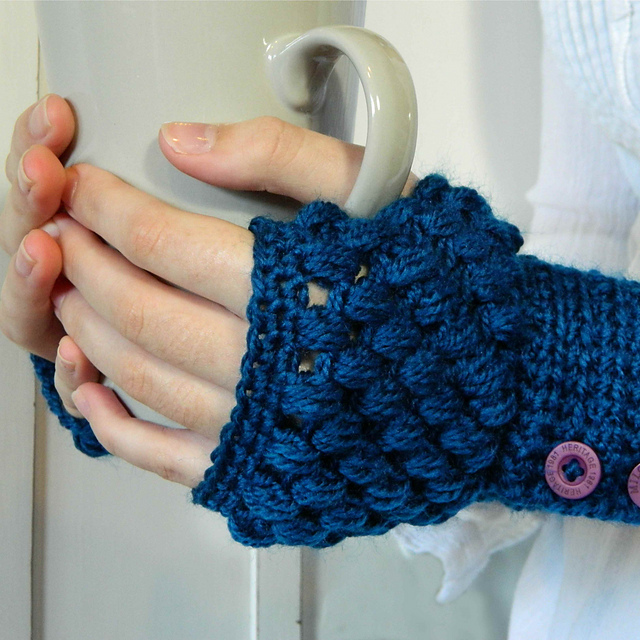 Crochet Openwork Handwarmers by creativeyarn on Creativeyarn: This is a very simple pattern, great for any new crocheter who’s ready to move beyond the granny square and put their skills to use making a garment. That said, they’re good looking enough any experienced crocheter would be happy to wear them! Beginner’s Wrist Warmers with Ridges by Rachel Choi, on Crochet Spot: Another great beginner pattern that looks good too! This pair is worked a little differently – as a flat rectangle, side to side. The end product is super warm and cozy, and a very different look from the above. Striped Wristlets by Lucy of Attic24, on Attic24: Lucy is known for her gorgeous color work, and these mitts are no exception! The pattern itself isn’t actually written out as such, but it’s just a simple rectangle seamed up the side – a crocheter with a bit of experience shouldn’t have too much trouble. 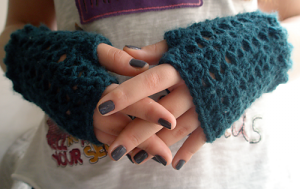 Puff Stitch Fingerless Gloves by Olivia Kent, on My Favourite Things: I love the fun texture of these, and the buttoned wrist cuff is so great! There are lots of pics here and I think this pattern looks very doable. She even includes instructions for making them in custom sizes! Twist Fingerless Glove Pattern by Bethany Scofield, on Bethsco Blog: I love the use of post stitches and ribbing in these highly textured mitts. The long wrists are sure to keep you nice and cozy too! The pattern includes tons of photos to explain every step, so even though they look complicated, you can make this pattern! 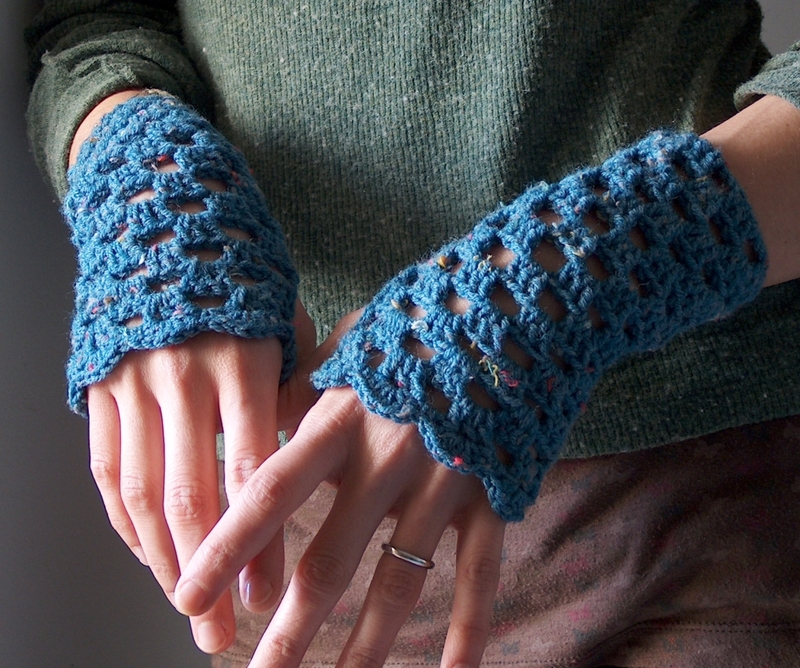 V-Stitch Fingerless Gloves by Daphne Bekiari, on Crafts by Sinjah: This is the perfect pattern if you are short on yarn – just 92 yards needed to make this pair! I imagine you could make a pair of these up super fast. Easy Victorian Shell Mitts by Bron Green, a Ravelry download: I’ve made several pairs of these, and they’re my go to pattern for a quick gift! They’ve got lots of stretch and have fit everyone I’ve given them too. 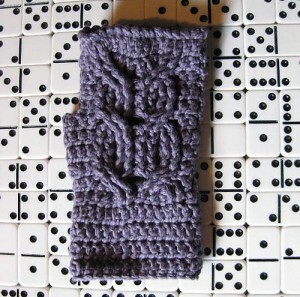 Add a few stitches to the cuff to make them extra warm and cozy! 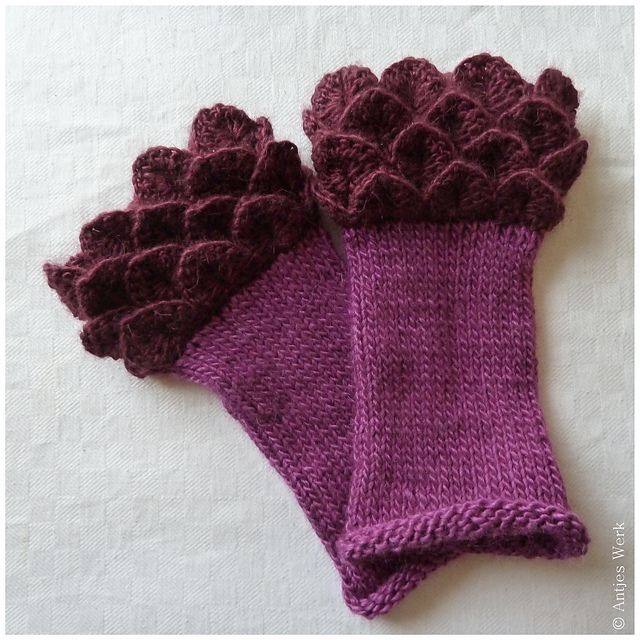 Magnolia by Antje Hackius, in antjeswerk.de: These mitts or pulse warmers are a gorgeous combination of knitting and crochet crocodile stitch. 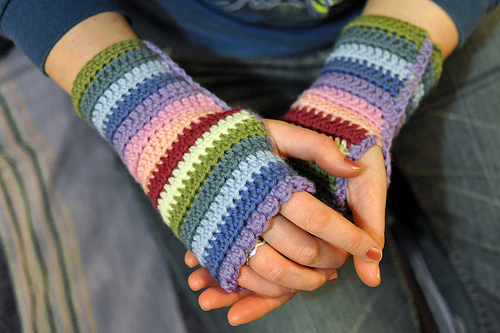 The knitting portion is very much beginner level, so if you can knit in the round you can make these mitts! The blog is written in German, but if you scroll to the bottom of the pattern there’s a link to an English pdf! Owl Mitts by Erica Ward, a Ravelry Download: Owls are still the most popular woodland creature out there, and these cabled mitts are a great way to show your love. All Grown Up Arm Warmers, on Moogly: I recently released the hat to match these fingerless mitts, but in case you missed it, here they are! 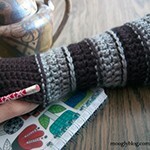 They feature one of my favorite ways to make pinstripes with crochet – post stitches! 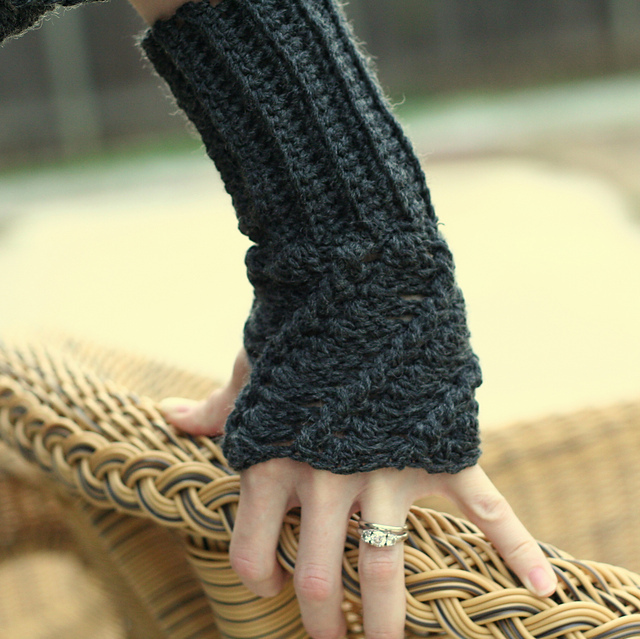 BONUS: Just added to Moogly, the Luscious One Skein Fingerless Mitts! (Matching cowl and hat available too! Have you made fingerless mitts before? What’s your go to pattern? Share with us in the comments! And if there’s a roundup topic you’d like to see in the future, please share that too! Stay warm out there! Fall’s Hot Trend: Free Knit and Crochet Skirt Patterns! OK, I had to bookmark this one! Thanks for the great links! You’ll need to be a member of Ravelry – which I highly recommend! 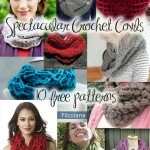 It’s completely free and it’s a great way to find new patterns! Yes, but don’t remember my log in information. I made the Phoenix Mitts by Julia Vaconsin as a present for my mum’s birthday – nice easy pattern and so pretty in variegated purple yarn! That is a great pattern Eleanor! Can you make a bookmark roundup? I’ll add it to the list, thank you Stacy! Thank you for sharing my pattern! This is a wonderful list! The marvelous ha d warmers are truly marvelous. Thanks for rounding them up for us! Your marvelous hand warmers are truly marvelous. Thanks for rounding them up for us! Oops! Sorry for the duplication! 😀 No worries! And thank you Debi! You are awesome! Thank you sooo much for all you do with this website! I’ve only tried the Red Heart ones for crochet. They were the ones The Crochet Crowd used for their September challenge. Very quick and easy, but swapping the yarn made them run small (even using a larger hook). 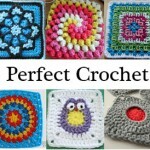 I was eyeing those Puff Stitch ones when I looked at patterns the other night. Red Heart is a pretty heavy aran so I can see how that would happen! The puff st ones do look like fun! And I’ve even got a puff stitch tutorial now lol. 😀 Thank you Tracie, glad you enjoyed the roundup! They do make great gifts (even for yourself heh). There is a copyright notice in the ivy wristers pattern but I found it on google and cannot trace it back to the original website where i found it for free. i can’t open the link of Twist Fingerless Glove Pattern it says im forbidden…. Looks like the designer closed that website – luckily she opened another! I’ve edited the post, and the new link is: http://bethsco.com/2011/02/twist-fingerless-glove-pattern.html#sthash.xUCtugeA.dpbs 🙂 Thanks for the heads up Thao! hi was wondering if you can help me out, am in need of mens (xl) mittens, thing is they need to be like baby mittens no thumbs,as this man has medical problems.Am having problems with sizing but how to get around the thumb area, ty so much for any help you can offer,and for all the great patterns and time you take for all of us. Hi Terri! That’s a very unique item, so I don’t think we’ll find a ready made pattern out there. I’m wondering if starting with a baby hat would work, and then decreasing at the wrist for the ribbing? Maybe you can try making a pair of felted ones for him? You could trace or measure the basic length and width you need then using an old sweater that is part wool or silk (to felt well) cut your shape allowing extra for shrinking. Sew around and wash & dry. Tips: I am bedridden an cold sensative living in Alaska… I add 2-4 inch to all my gloves, mitts, etc. 2. You may want to leave an over lap opening at the wrist for ease of on and off with button closure on over lapping edge. You can email me at [email protected] to brainstorm. Great list of really cute and quick wrist warmers. 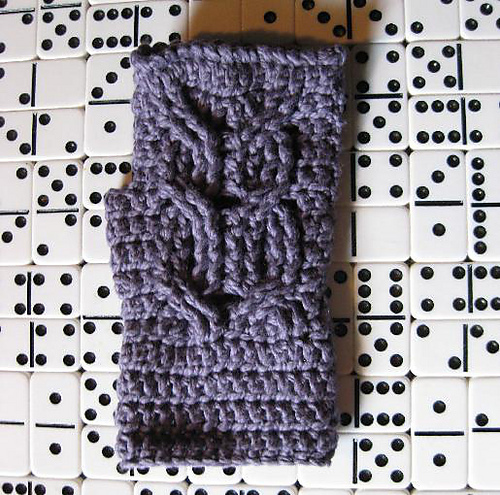 My favorite pattern is to crochet a foundation chain about 35 stitches long and then single crochet into the back loops each row making a stretchy and thick, therefore warm, piece. I make a rectangle (like Lucy’s pattern) and then sew it up leaving a thumb hole. I like to crochet up my thumbs a bit for warmth, but that’s strictly discretionary. Adding edging to the wrist end helps with lengthening the cuff a bit and a ruffly edge on the distal edges makes them cute and finished-looking. Easy peasy really and can be done in an evening. 🙂 Thank you for sharing Lynda! Love all the patterns you have, but have one question for you. 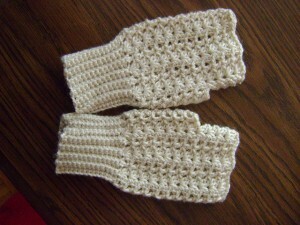 Would you have an easy pattern for a crochet fingerless glove that has a flip top to go over your hand. Not the kind that you do indiviual fingers, has open on the top where fingers are free. 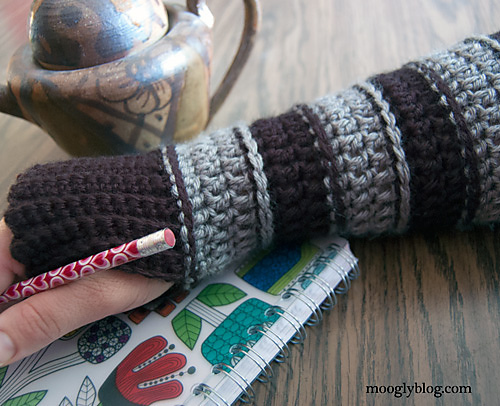 Want so much to learn how to crochet with a flip top to cover all fingers. Thank you .